Persistence Market Research, in its recent report on the automotive glass market, provides a detailed value-volume analysis of the automotive glass market on the basis of various segments such as application, glass type, sales channel, vehicle type, and region. In terms of application, the back glass segment is projected to lead the market share in terms of volume, owing to the high volume consumption of this glass for automobile vehicles, while the moon/sunroof segment is anticipated to provide lucrative growth opportunities in the global automotive glass market. Automotive glass is one of the key components of an automobile vehicle, which not only offers safety to the passengers, but also provides better aerodynamics to the vehicle and helps in reducing fuel consumption. The large volume of automobile vehicle sales and the growing adoption of moon/sunroofs in passenger vehicles are some of the key factors contributing towards the growing demand for automotive glass, globally. Hence, the automotive glass market is projected to witness robust growth over the forecast period. The automotive glass market report covers market analysis through basis point analysis (BPS), incremental dollar opportunity index, market attractiveness analysis, and Y-o-Y growth for the historical period 2013–2017, and a forecast analysis for 2018–2028, with 2017 as the base year. The automotive glass market report begins with an executive summary covering a gist of the overall report, highlighting the global automotive glass market overview in terms of value and volume through various segments. The section also covers key supply and demand side trends, technology roadmap, and PMR analysis and recommendations for the global automotive glass market. The market introduction section of the report covers the market definition, market taxonomy, and research scope of the automotive glass market. The market background section of the global automotive glass market report includes macroeconomic factors, value chain analysis, drivers, restraints, trends, and opportunities, along with forecast factors affecting the growth of the automotive glass market. The market forecast section provides a pricing analysis of the automotive glass market on the basis of regional fronts by application, wherein, weighted average price has been computed to arrive at global average prices. This section also covers global market analysis on the basis of different segments, along with regional segmental analysis in terms of volume and value, Y-o-Y growth, market attractiveness index, and market share. This section covers the automotive glass market analysis for the key emerging countries that are projected to create lucrative growth opportunities for automotive glass manufacturers around the world. In the final section of the report, a detailed competition analysis has been done with market share analysis pertaining to the automotive glass market, and performance of manufacturers by a tier-down structure of the global automotive glass market. The section also covers the detailed company profiles of key players in the automotive glass market. Examples of some of the key competitors in the automotive glass market are AGC Inc., Nippon Sheet Glass Co., Ltd, Saint-Gobain S.A., Fuyao Glass Industry Group Co., Ltd., Xinyi Glass Holdings Ltd., Magna International Inc., Vitro, S.A.B. de C.V., Glas Trösch Holding AG, Corning, and CENTRAL GLASS CO., LTD., among others. The first stage of the automotive glass market research entailed the formulation of an initial hypothesis, which was considered from primary as well as secondary approaches. To analyse the automotive glass market share and competition analysis, we tracked key developments in the automotive glass market, such as collaborations, expansion, mergers & acquisitions, new orders, product launches, and awards and recognition for companies operating in the market. Competition benchmarking has been provided for the top 5 competitors with respect to the sales performance of automotive glass. The global automotive glass market was valued at over US$ 19 Bn in 2017. The automotive glass market is expected to experience robust growth, with a 4.0% CAGR over 2018–2028. East Asia and Europe are expected to remain the largest regional markets in the global automotive glass market throughout the forecast period. Increase in vehicle production, coupled with increase in the demand for luxury vehicle in European countries such as Germany & the UK, and the presence of most of the glass manufacturers in Europe, are expected to be the key factors driving the demand for automotive glass. 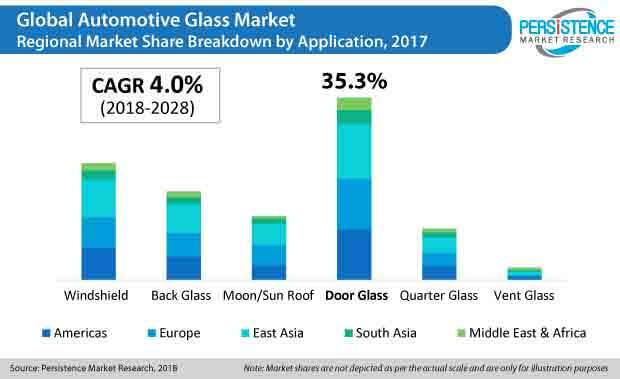 North America and South Asia are expected to create high growth opportunities for the manufacturers of automotive glass over the forecast period. Passenger cars is expected to remain a high volume segment in the automotive glass market, owing to the increasing need for personal commute from one place to another. With the continuous increase in the global population, from ~6.9 Bn in 2010 to ~7.4 Bn in 2016, and it is estimated that, the automotive industry will show the same trend in the coming years. Additionally, high standard living of consumers is a gaining trend worldwide, which will accelerate the growth of the automobile industry, which, in turn, would drive the growth of the automotive glass market. With the rising implementation of stringent environmental regulations and emission control measures, hybrid & electrical vehicles (HEVs) are boosting growth in the global market. Manufacturers are already increasing the percentage of electric and hybrid cars in the market. This number is anticipated to increase in the near future, as both, vehicle buyers and manufacturers seek more sustainable alternatives, giving a push to the market for hybrid and electric cars, which, in turn, will accelerate the demand for automotive glass in the global market. In luxury vehicles, expensive automotive glass is used to enhance their overall aesthetics and safety. Currently, Daimler AG’s Mercedes-Benz and BMW are focused on enhancing the comfort level of their luxury cars. In terms of production of luxury vehicles, Western Europe was pegged at 771,001 '000 units in 2017. By the end of 2026, this production volume is projected to reach 1,143,840 '000 units, owing to the increasing demand and rising consumer spending on luxury vehicles. Among all the developing nations, China is expected to have the highest growth potential. Increasing industrialization, urbanization, and economic growth across the globe is boosting the demand for automobiles in the market, which, in turn, is accelerating the demand for automotive glass. Increasing disposable income is forcing investors to invest more in the automotive industry. The rise in the total automotive production, from 95.6 Mn in 2016 to 96.2 Mn in 2017, shows that the demand for automobiles is increasing year by year in the global market, which, in turn, will significantly progress the growth of the overall automotive glass market. The global automotive glass market represents a fairly consolidated competition landscape, wherein, tier-1 companies hold around 72-76% revenue share. Top companies in the automotive glass market include AGC Inc., Nippon Sheet Glass Co., Ltd, Saint-Gobain S.A., Fuyao Glass Industry Group Co., Ltd., Xinyi Glass Holdings Ltd., Magna International Inc., Vitro, S.A.B. de C.V., Glas Trösch Holding AG, Corning, and CENTRAL GLASS CO., LTD., among others. The emergence of a large number of manufacturers from China that offer low-cost automotive glass has created a huge price variation in the automotive glass market around the globe. Leading players in the automotive glass market are concentrating on the expansion of their market footprint in key developing regions, along with strategic collaborations with domestic players to maintain their position as market leaders.